For those interested in helping to block Nestle from pumping water in the Spring Creek Watershed, there will be a door-to-door flyer drop in Spring Township. The plan is to go out this weekend from 1 – 5 pm on Saturday, March 10 and Sunday, March 11. We’re meeting at the home of Courtney Morris, 268 S. Main St. in Pleasant Gap near the Pleasant Gap Elementary School. Park around the corner on Whiterock Road. For more info, contact Lynne Heritage – llheritage@comcast.net. 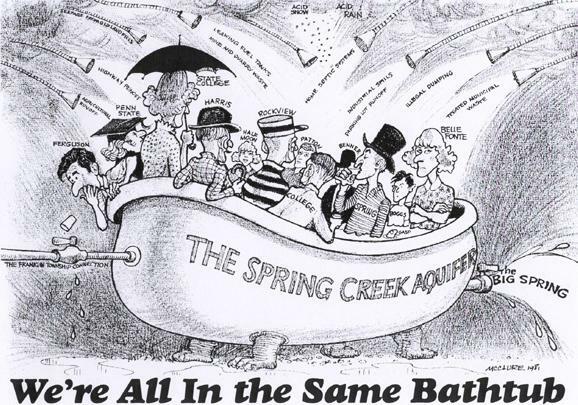 As illustrated by Jim McClure in 1981 (image above), ClearWater Conservancy is founded on the belief that ‘ we’re all in the same bathtub.’ The water each one of us relies on for household, industrial, and recreational use knows no municipal boundaries. We all share the important job of responsibly managing our region’s water supply. Below are upcoming opportunities to stay informed, ask questions, and provide feedback regarding Nestle’s proposed plan to purchase water from Spring Township Water Authority and build a bottled water manufacturing facility in the region. Please note the varying hosts and Q&A formats for each event. Nestle Waters regional Natural Resource Manager Eric Andreus will give a short presentation about the proposed factory located in Spring or Benner townships. A panel of experts will also be available to answer questions. Community members can submit questions by filling out a card beforethe session, by emailing NWNA.Pennsylvania@outlook.com or calling 1-800-450-7599. A water use forum will be hosted by Lara Fowler from Penn State Law. The forum is at the invitation of the Spring Creek Watershed Commission. Lara teaches an environmental mediation course at Penn State and will be inviting in all interested stakeholders to discuss factual realities and concerns around water uses and seek to establish a record of common ground with her 18 students from her class. Denny Hameister who chaired the commission may be able to offer additional insight.